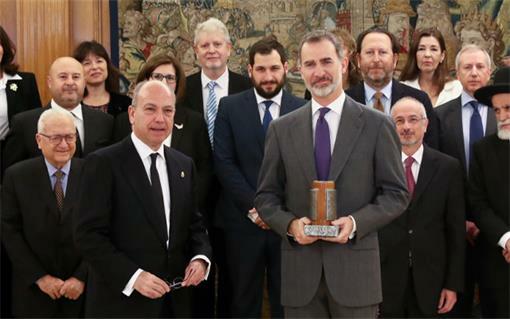 Isaac Querub Caro, President of the Federation of Jewish Communities of Spain (FCJE), the representative organisation of Spanish Jewry and the country’s EJC affiliate, presented the ‘Senador Ángel Pulido’ Award to H.M. King Felipe VI of Spain for the broad and unconditional support that the Spanish Crown has provided for the revival of Jewish and Sephardic life in Spain and in the world, as well as to the mutual friendship between the peoples of Spain and Israel. Isaac Querub Caro, predsjednik Federacije židovskih zajednica u Španjolskoj ( FCJE) , koja predstavlja organizacije španjolskih Židova i član je EJC, predao je nagradu ‘ Senador Ángel Pulido’ španjolskom kralju Felipe V I . za veliku i važnu potporu koju je"Španjolska Kruna" pružila za oživljavanje židovskog i sefardskog života u Španjolskoj i svijetu, kao i za prijateljstvo između naroda Španjolske i Izraela. dalje čitajte u originalnom članku. The award is named after one of the most outstanding political figures during the “Restauración” period in Spain (1874-1931). Ángel Pulido was a Spanish senator, physician and writer, who he had his first contact with Sephardic Jews in 1893, whilst traveling on a steamer on the Danube. Afterwards, he began to work intensely to get the descendants of those Sephardim expelled in 1492 closer to the Spanish people and its institutions.